The cover of Manga Time Kirara's June 2017 issue has revealed that manga Slow Start will receive a TV anime adaptation. The issue officially goes on sale on May 9. Hana Ichinose is a normal 16 year old high school student. However, there is something different about her: She enrolled in high school one year late! Her classmates are unaware of this, and Hana will have to work hard to catch up with everyone else. 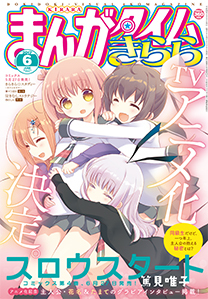 Slow Start is drawn by Yuiko Tokumi and began its serialization in Manga Time Kirara in June 2013. The series currently has three compiled volumes in print, with the fourth volume to be released on June 27. Huh, synopsis sound kinda weird, why she's not just one year lower then? I'm a bit interested. This looks undeniably cute. Considering the last couple times we got something of this nature, either Doga Kobo or Silver Link would be perfect for this. Although, I have a soft spot for Doga Kobo so I'd be more happy with them getting the work. The premise is something that does catch my interest a bit since it's a topic not really talked about much. Either way, will plan to watch. Maybe or possibly Silver LInk could be a candidate too. Maybe I'm biased, but after Gabriel DropOut and New Game, I'd rather see Doga Kobo in this role. Silver Link does not have its own style, I think. Seems like a perfect candidate to watch while relaxing. Another cute girls doing cute things series. Might check it out for fun. Let me guess - this manga will adapt by Doga Kobo? @jc9622 Well, personally, I do not mind. Any yonkoma adaptation is always on my list including this one. Doesn't sound anything special, but I'll check it out, anyway. More moe! Felt alive again after resding the news. Looks like it. It's Doga Kobo's specialty. If that happens I hope Masahiko Oota will handle this. It seems to me that in a couple of years all the slice of life about the cute girls will be adapted only by them. However, they are good at it. Doga Kobo is one of the few anime studios that can produce a very entertaining slice of life series so I don't mind if they adapt all the CGDCT Slice of Life shows. Funny synopsis, it intrigues me to watch it. Ohhh, my body is ready for this one.